A large terrace to relax under the sun and enjoy the view on the canal. 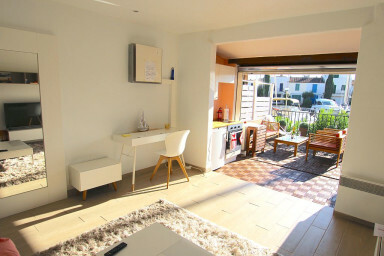 Pretty 3-room apartment 5-minute away by walk from the center of Port Grimaud. It is located on an elevated ground floor and has a large terrace with a beautiful view on the canal. A good combination to relax. It is composed of a living-room opening onto a loggia done as a kitchen, a bedroom with a double bed, an indépendant cabin-bedroom with single bunk beds and a shower-room inbetween the 2 bedrooms. An entrance hall to store the bicycles. A cosy apartment for 4 people.